The Ontario Sister City Committee was founded and organized on July 19, 1975. Ontario's first sister city affiliation occurred on January 18, 1977, when Ontario City Council and the Mayor passed Resolution 8100 officially adopting Brockville, Ontario, Canada, home of the Chaffey Brothers who founded Ontario, California. Since that time, other cities have been chosen because of their similarities to Ontario and their willingness to develop friendships and cultural exchanges. Ontario has formed affiliations with Winterthur, Switzerland; Guamuchil, Los Mochis & Mocorito, Sinaloa, Mexico (1982); and Jieyang, China. 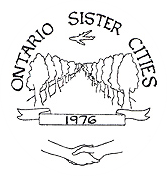 Originally formed as a city committee, Ontario Sister Cities became a nonprofit corporation in December 7, 1979, because of its widespread acceptance and grand success. Ontario Sister Cities is a nonprofit organization created to foster an exchange of cultural, social and economic information between the City of Ontario and its designated Sister Cities: Brockville, Canada; Winterthur, Switzerland; Guamuchil, Los Mochis & Mocorito, Sinaloa, Mexico; and Jieyang, China. Providing networking opportunities with local businesses, service groups and municipality in promoting the mission of O.S.C.